Published: March 15, 2015 7:05 pm Updated: March 16, 2015 11:36 a.m.
Jared Ward, who recently completed his eligiblity at BYU, finished third in Sunday's L.A. Marathon and in the process became the 2015 U.S. marathon champion as the top American finisher. Otherwise, the day belonged to the heat and to the Kenyans, with Daniel Limo winning the men's race in 2:10:35 and Olga Kimaiyo winning the women's marathon in 2:34:10. Conditions were far from ideal for marathon running, with temperatures reaching nearly 80 degrees by the race's end. Because of the heat, the start of the race was pushed back a half-hour. A reported 26,000 runners participated in the event. 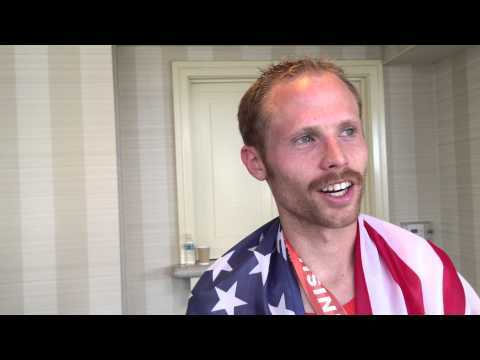 The race doubled as the U.S. marathon championship and Ward made the most of it. It was only the third marathon of his running career. In his debut two years ago, he timed 2:16 in the Chicago Marathon. Last fall he placed second in the Twin Cities Marathon with a time of 2:14:00. On Sunday in L.A., he clocked 2:12:55. "He's had a solid progression," said Ward's coach, Ed Eyestone, a two-time Olympic marathoner himself. Eyestone watched the race on cable and on the Internet simultaneously in Fayetteville, Ark., where his BYU track and field team was competing in the NCAA indoor championships. "This win makes Jared a solid contender for the Olympic team," said Eyestone. The 2016 L.A. Marathon will serve as the U.S. Olympic Trials Marathon. Ward started the race conservatively because of the heat and it proved to be a prudent strategy. He reached the halfway mark in 1:07 behind nine Kenyans, but he ran the second half of the race faster than the first half and overtook seven of the Africans. "We knew going in that Jared was going to have a good race," says Eyestone.